John Calicchio’s love of motorcycles and his obsession with Triumphs traces back to his formative years in Southern California. “One day in 1965 while walking to high school, I saw some guy come flying down Fairview Road doing a wheelie on a Triumph 650 Bonneville,” says Calicchio. “There is nothing more stunning than watching a guy wheeling a motorcycle at a 45-degree angle with even throttle. That was it; I got bit big-time by the motorcycle bug.” That bug bite spread into Calicchio’s bloodstream and manifested itself years later as his California-based company, Triumph Classic Motorcycles. 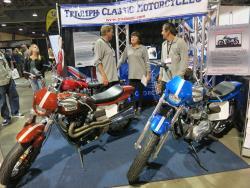 Obviously, there is a bit of a back story before Triumph Classic Motorcycles was founded. Calicchio’s early years in the sport were spent wrenching on the motorcycles of the ’60s and early ‘70s. He was also an active TT and flat track racer. Calicchio parlayed that passion for motorcycles into a couple of successful early businesses. The first was John’s Racing Cycles, which he built from the ground up and later sold. 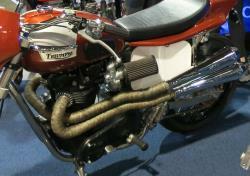 The next venture was JRC Engineering which was a company that manufactured hard-to-get parts for Triumph motorcycles. After he developed JRC Engineering into a successful business, Calicchio sold the enterprise and worked in the computer industry for a period. However, as they say, home is where the heart is – and Calicchio’s heart was always with motorcycles. “I’ve now turned back full circle to my first love; restoring British motorcycles,” says Calicchio. The motorcycling world is a better place because of that return. The mission statement of Triumph Classic Motorcycles is “Dedicated to the preservation of classic British motorcycles.” That’s a worthy goal indeed. At TCM, that preservation includes originals, original restorations, and custom builds. K&N filters protect a lion's share of Calicchio's restorations. 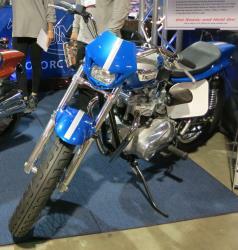 Calicchio brought a beautiful stable of Triumphs to the Long Beach stop of the Progressive International Motorcycle Show (IMS). 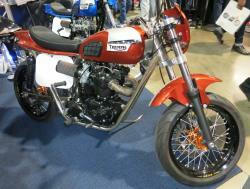 The meticulously restored and updated Triumphs drew steady streams of classic bike enthusiasts. The bikes are a great mix of the classic lines of the vintage Truimphs with modern and carefully crafted performance touches. Simply put, the bikes work – both visually and mechanically. One of the newest lines for company includes the TCM Street Trackers. The bikes feature thoroughly modern Progressive suspensions, high-end braking systems, light modern aluminum rims laced with stainless spokes, and a choice of 650cc, 750cc, or 800cc engines installed in the powder coated Triumph frames. The Street Trackers are street legal road burners that even come with a warranty. You’ll also notice that the TCM Triumphs that graced the Long Beach IMS were proudly wearing K&N filters. It was back when he was still the owner of JRC Engineering when Calicchio first met K&N founder Ken Johnson. “I was first introduced to Ken in 1977 when I needed an air cleaner designed for my new line of Mikuni Carb Kits for my company, JRC Engineering,” Calicchio recalls. That relationship with K&N has continued in the 40 years since that initial meeting. Now, a significant number of the stunning vintage Triumphs that are restored by Triumph Classic Motorcycles breathe through K&N filters. “Yes, we like K&N products,” Calicchio says.